When Windows PowerShell 3.0 shipped, the team created an extensibility mechanism to allow a third party to “take over” the line editing experience. That hook is a function called PSConsoleHostReadline that PowerShell will call – if it exists – to read a line of text from the user. The simplicity of this interface belies the potential complexity of what it needs to do. Users expect to be able to do more than just type a command, mistake free and press enter. No, they want editing features like cursor left/right, backspace, delete, kill to end of line, multiline editing, etc. After installation, import the PSReadLine module to have it take over your command line editing experience. 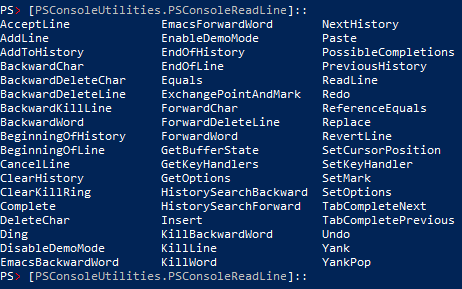 Note: the PSReadLine module only works for the PowerShell.exe console. It does not work for the PowerShell ISE console pane. Notice the red “>” in my prompt? That is telling me I have a syntax error in this command. If you look at the end, I’m missing a closing “}”. Type in that closing “}” and the red goes away. How about being able to paste into the console using Ctrl+V like you can in ISE. PSReadLine has got that covered. Ever deleted something accidentally in the line and wanted to get it back? Try the handy Ctrl+Z/Ctrl+Y shortcuts for Undo and Redo. Yes!! This line editor has a full blown undo/redo stack. You can’t go to a previous line to edit it. You have to completely start over. Pressing the UpArrow just cycles through history on the current line which means your current line edits get blown away. You can’t use Up/DownArrow history recall to recall the *whole* multiline command. You can only recall one line at a time which makes multiline commands a major PITA to recall & edit in the console. But you can use the Right/LeftArrow keys to move the cursor between different lines and then edit those lines. You still don’t want to use the Up/DownArrow keys for line navigation as these keys are still bound to history recall. Update 4/5/2015: You can now use the Up/DownArrow keys to move around a multiline command. You just need to press the Left or Right arrow key once (or press Home or End) and after that the Up/DownArrow keys will no longer cycle history, they will move the cursor up or down through the multiline command. To get out of this mode either press enter to execute the multiline command or press Esc. Note that I’ve defined a few more keybindings that allow me to use the UpArrow and DownArrow keys to not only navigate backward and forward in history on an empty line but navigate based on a match as well. That is, when I type the beginning of some command line, the UpArrow and DownArrow keys search history backward or forward respectively for command lines that match what’s been typed. If you spend a lot of time at the PowerShell console you owe it yourself to give this module a try. And if you run into issues, remember these are still somewhat early bits, the project developer has been responsive to fixing bugs. You can post/view issues here on GitHub. For more info on PSReadLine, check out the about_PSReadline topic after you have installed the module. Jason has delivered some new PSReadLine presents for the holidays. Version 1.0.0.6 supports some notable new features. My favorite of which is that you can select text using just the keyboard. As if you were in Notepad or VS, press Shift+Right/LeftArrow to select one character at a time or use Ctrl+Shift+Right/LeftArrow to select whole words at a time. Once you have the desired text selected you can press Ctrl+x to cut or Ctrl+Shift+c to copy. Before careful with the copy keyboard shortcut because if you forgot to press Shift, the resulting Ctrl+c will abort the current command line and you can’t get it back – not even with Ctrl+z (undo). I wonder if perhaps the default copy shortcut should be something like Shift+Insert – old school – to avoid any potential mishaps with Ctrl+c? The version of PSReadLine that ships with Windows 10 build >= 10130 now integrates PSReadLine into the standard Microsoft PowerShell namespace. So in your handlers you will need to change the namespace PSConsoleUtilities to Microsoft.PowerShell. These two keyhandlers will allow you to navigate around your command line by jumping forward and backward between pipeline stages. They use CharacterSearch and CharacterSearchBackward to move around the command line by searching for “|” characters. So Ctrl+\ moves forward to the next “|” character and Ctrl+Shift+\ moves backwards to the previous “|” character. Major kudos to Jason and this awesome module. It is funny how quickly you just get used to it and then when you’re on someone else’s PC without this module – well – you convince them pretty quickly that they need PSReadLine. The second handler was inspired by mjolinor’s Clip-ToArray ISE add-on. It is a more basic version of his function which I call – PasteAsHereString. It is indeed handy and could be easily modified to do all that the original Clip-ToArray function does. This entry was posted in PowerShell, PowerShell 3.0, PowerShell 4.0. Bookmark the permalink. Great Article Keith! Just installed this module! love it! Thanks a lot! Live significantly improved! Thanks a lot for this article Keith. This module and his added functionality is defeinitly a must ! Wow! Just an amazing module! Found this via Hey, Scripting Guys! and read all that I could and am extremely grateful I did. Just the amount of features and the added abilities to make working in the console that much more fun, and better — you’d be doing yourself a huge favor by using this. Thank you so much. I’m trying to get handler to create the pairs of quotes but it’s throwing lots of errors. Is there an issue with &quot? I’ve replaced that with ” and it still throws errors.